Where did you get the leather straps from? Last edited by Psycho50501; 03-20-2017 at 05:13 PM. To the photographer I would say..Outstanding photo. Great use of props and scenery. Dang I want that trench coat! Great photo. Who did you talk to that said they are making more Don's? Like an actual NECA rep? Did you speak to someone off the record? Or like a customer service rep? There is still a ton of interest in these so I just put in an order request for more Donny and Raphs. I also asked that if they cannot fill my orders when they will be restocked or resissued. My orders and requests come direct to/from NECA. Also got my leather straps. So much better than ribbon. Can you give us details on where you got your stands and leather straps? Yeah is this guy TheMasterTurtle was talking about that stole his pizza box design? I made the stands myself. EE is now saying Raph June 2017... my preorder must have fallen into the later shippments. oh well. i will hurry up and wait. These figures make Godot look punctual. They are being released in my reverse favourite order too, which is argh. Maybe I'll learn to appreciate Don a lot, alone. I was able to find a Raph at Salt Lake ComicCon! I am very excited to one day have all 4 setup in my family room together. Now I just need to find a decent deal on a Don. Was just on an end cap along with a neca 1989 Batman and Deadpool. I just noticed today TRU website has them as "new." But out of stock. I am checking frequently and hope to snag one as soon as it goes live with inventory. It also says sold in stores so I'm calling my local store tomorrow hopefully getting lucky. If I get one I'm canceling my EE order. Wow thats cool you actually saw they AT toys r us. I thought you were only getting them through their online store. I'm headed to mine tomorrow to see what I can see. 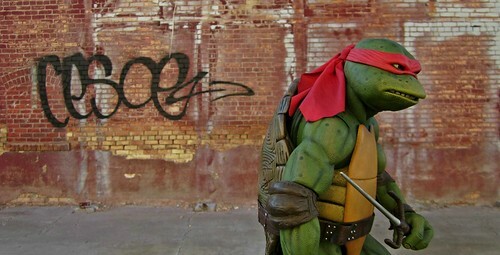 If I can find a Raph maybe I can find somebody thatd trade me their Don for a Raph.